Tree House Triple Shot Pure Heaven! 2014 saw the creation and evolution of one of our proudest accomplishments here at Tree House: Double Shot. Over the year we often wondered how far we could push the coffee and still maintain a balanced and delightful beer. In the spirit of maintaining the integrity and refinement of the original Double Shot, we created a new base beer to withstand precisely double the coffee addition Double Shot receives to satisfy our curiosity. The result is something quite surprising and completely original! 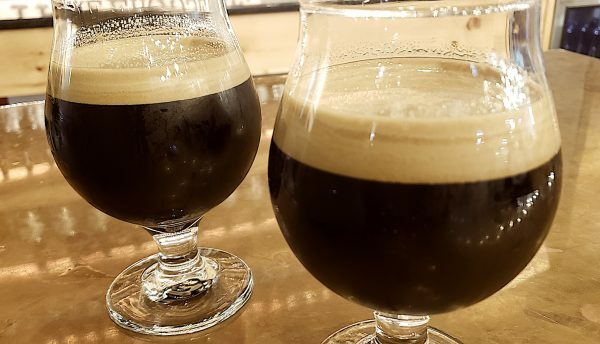 More milk chocolate than coffee, and more brown sugar than molasses, Tree House Triple Shot conveys a super unique flavor profile that explodes with complexity as it warms. The crew here tastes “straight chocolate syrup”, ”chocolate covered raspberries”, “sweet espresso”, and “chocolate Charleston Chew (seriously)”. A truly rich treat that begs to be shared – we’re psyched to shared it with YOU! Tree House Triple Shot was the highlight of my trip to the brewery, maybe the beer highlight of my year. It was only a 10 ounce pour but I wanted it to last forever. Truly decadent filled with whirling complexity, flavor packed with super chocolate, complimentary espresso, some cherry notes and a lush mouthfeel. This rushes to the top of my beer list at 98 points. What’s the only thing that keeps it from a perfect 100? – the fact that I had to drive 3 hours for just 10 ounces. Sigh!